*Please note tiles seen on the videos are previous models. New tiles have NO more bevels on their surface. .
VersaFit™ High Impact Gym Flooring Tiles have a number of excellent features to enhance the look, feel and longevity of your gymnasium floor. VersaFit™ is an environmentally friendly, homogeneous EPDM / recycled floor covering for areas subject to heavy wear and high impact. The durability, flexibility, safety, comfort, slip resistance and aesthetic appeal makes VersaFit™ a perfect solution for both indoor and outdoor flooring applications. VersaFit™ is made to last the busiest gyms, cross training boxes, clubs and workout areas without cracking or bre00000000000000000aking. VersaFit™ can be installed in areas with heavy foot traffic (free-weight areas, strength training areas and group class areas, etc.) and will last the test of time with daily use. Safety is the number one concern of commercial gym applications. VersaFit™ has been designed for excellent performance in slip resistance, fire behaviour and smoke emission to ensure safety in the workplace and gymnasium whilst exceeding all compliant requirements. All VersaFloor™ products are made with raw materials that are not known to pose any hazard to the environment and to the people during manufacturing and handling process; free of asbestos, free of halogens and free of PVC. VersaFit™ Gym Floor Tiles use direction free rubber chips, in a variety of colours which allow for a wide variety of patterns and expand the gym owner's choice to express their creativity. VersaFit™ brings a large range of designs and colours making it easy and efficient to design rubber flooring. It can even be used both indoor and outdoor*. VersaFit™ uses highly flexible compounds providing a high level of noise abatement. By using the highest quality rubbers and compounds, flexibility and permanent resiliency are maintained throughout its life offering a very high degree of comfort under-foot and anti-fatigue. This is particularly important for use in gyms and fitness clubs. Simply sweep the surface of your flooring with a soft-bristled broom or use a vaccuum to clean. VersaFit™ contains a microbial treatment which ensures freshness at all times and reduces the risk of mould build up. VersaFit™ contains a high percentage of recycled rubber and contains no substances that harm the environment. It is halogen free, formaldehyde free and PVC free. VersaFit™ itself can be fully recycled and does not generate toxic substances at the end of its life. Why Choose VersaFit Gym Tiles? VersaFit Gym Tiles have been tested for Formaldehyde content, Phthalates, Lead and VOC. VersaFit PASSES all respective tests. VersaFit Gym Tiles are safe to use. Produced by ISO 9001:2008 registered manufacturer of high quality resilient rubber flooring products. VersaFit is committed to environmental protection and stewardship. VersaFit’s goal is to mitigate impacts on the environment by working with all stakeholders to promote and implement responsible environmental practices, products and continuous improvement. 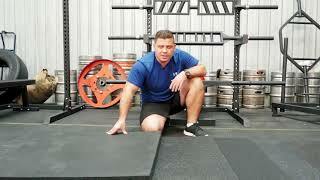 VersaFit 15 mm x 1m x 1m gym safety surface tiles, moulded under pressure and heat. Designed to provide a resilient, durable, slip resistant surface with excellent impact attenuating properties. Made of 100% tyre rubber shred bound by a clear MDI polyurethane binder. Environmentally friendly with no Formaldehyde, no Phthalates, no Lead and low VOCs. Produced by ISO 9001:2008 registered* International manufacturer of high quality resilient rubber flooring products. To tell the difference between chinese made tiles vs VersaFit Rubber Gym Tiles just look at the bottom of the tile for the VersaFit logo moulded into the tile, and each tile includes laying instructions. Buy VersaFit Gym Tiles and you will be gauranteed a safe and quality product for years to come! Delivery was on time as advised. Overall they quite good and do the job. My order for what I suppose would have been a relatively small number of 1 metre sqare rubber floor tiles, was received and despatched quite quickly, with delivery occurring within a few days of placing the order. I wish now I had ordered another 6 of these tiles as they look so good in our garage-housed gym set-up. I am very happy with the whole experience. Colour is not much of a big deal, but those grey flecks are beautiful. I recently had my hair dyed grey as well so yeah the tiles and I match lol ;) Overall, I like how these are slip resistant. They also feel comfortable on my feet so I highly recommend this one! This is what I use for my fitness club. I always choose Versafit because it is high quality and safe. It's also eco-friendly which is a good plus.